Order 8×19 construction compacted wire rope with a plastic core and reap the benefits of this durable design. The plastic impregnated 8×19 container crane rope allows for repetitive lifting cycles to fly by with ease while preventing fatigue and still maintaining structural strength. steel wire you would expect, it comes with the added benefit of plastic impregnation. This layer acts to make the entire construction of the rope more manageable and flexible, which in turn helps with high cycle rate operations in punishing environments. 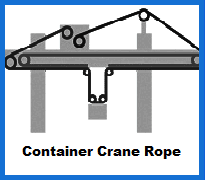 The 8×19 construction is precisely what you often require from container crane rope. It offers good levels of strength, long service life and the ability to avoid being compromised by crushing or other external influences. Pick and choose from diameters ranging between 6.5mm and 15mm, matched with breaking loads of 41.8kN to 233kN. Rope which is suitable for shuffling shipping containers is not all we offer. You can order tower crane rope, wire rope fittings, tools and equipment of every conceivable kind at Rope Services Direct. You may also benefit from one of our height safety kits if you work on cranes. If you need more information about the benefits of plastic impregnated wire rope, or have a query about the other products offered by Rope Services Direct, get in touch today. Pick up the phone and call 01384 78004 or write up your question on our contact page. 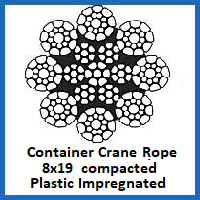 Plastic Impregnated 8x19 Container Crane Rope Overall rating: 5 out of 5 based on 6 reviews.